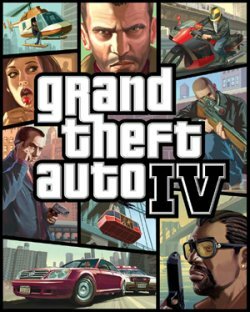 Grand Theft Auto IV is the eleventh installment of the Grand Theft Auto video game franchise. It was announced by Rockstar Games on October 16, 2007 for Xbox 360 and PlayStation 3. It was released worldwide for both systems on April 29, 2008. The game uses Rockstar's in-house RAGE game engine, which was previously used for Rockstar Games Presents Table Tennis. The game had two expansions, The Lost and Damned and The Ballad of Gay Tony, both of which were originally exclusive to the Xbox 360 but were later released for the PlayStation 3 and Windows. Niko Bellic is an Eastern European immigrant in his early-thirties, who has come to Liberty City to pursue the "American Dream". Niko was persuaded to move to Liberty City by his cousin Roman, who claimed in multiple e-mails to Niko that he was living a fabulous life, with two women, four hot tubs and fifteen sports cars; but he was in fact telling lies to hide his own failures. Roman is the only person Niko knows in Liberty City to begin with, and is one of his major connections in the first part of the game. Niko is a tough character, whereas Roman is friendlier. Roman, however, is heavily in debt and a lot of people are after him. In desperate need of help, Roman deceived Niko to move to Liberty City. However, most of the time they end up arguing over various issues. It is later revealed that Niko and Roman have been avoiding each other due to unknown problems at home. This page was last edited on 16 August 2016, at 16:24.